Claude Monet (1840–1926), Impression, Sunrise (1872), oil on canvas, 48 x 63 cm, Musée Marmottan Monet, Paris. Wikimedia Commons. For much of the history of Western Art, one of its underlying principles has been to reveal rather than to hide. Atmospheric and other effects which tend to obscure the image being painted have generally been shunned. The great majority of landscape views, at least until the nineteenth century, have shown fair weather, good visibility, and optical clarity. This is peculiar to the Western tradition. East Asian art in particular has long favoured views in which significant passages are obscured by cloud or fog. In this, the final scene in Qiu Ying’s Ode on Shanglin Park, the emperor’s carriage and cortège pass along the edge of a river or estuary. There are ships at anchor, and areas of padi cultivation at the water’s edge. In the distance are more pavilions and houses, all of which are surrounded by a blanket of low fog. Two great landscape artists were largely responsible for changing attitudes towards the use of fog and cloud as major compositional devices: JMW Turner and Caspar David Friedrich, both painting in the first half of the nineteenth century. 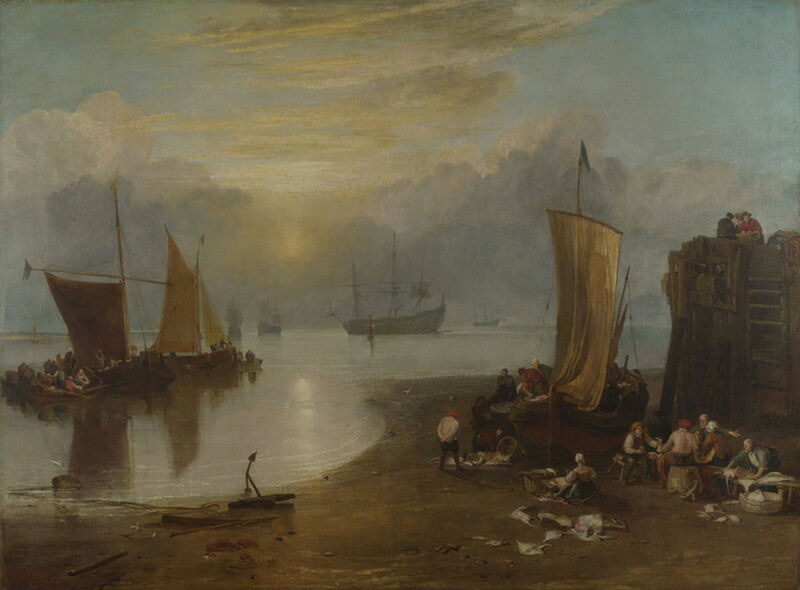 Joseph Mallord William Turner (1775–1851), Sun rising through Vapour: Fishermen cleaning and selling Fish (before 1807), oil on canvas, 134 x 179.5 cm, The National Gallery (Turner Bequest, 1856), London. Image courtesy of and © The National Gallery. Turner painted Sun rising through Vapour: Fishermen cleaning and selling Fish before 1807. With the sun rising and slowly dispersing banks of fog, larger ships in the distance are emerging and taking form. In the foreground, three fishing boats are discharging their catch. This early in his career, Turner perhaps didn’t dare to bring the fog effect any closer, and was careful to populate the foreground with people and boats. Joseph Mallord William Turner (1775-1851), Rain, Steam, and Speed – The Great Western Railway (1844), oil on canvas, 91 x 121.8 cm, The National Gallery (Turner Bequest, 1856), London. Courtesy of and © 2018 The National Gallery, London. 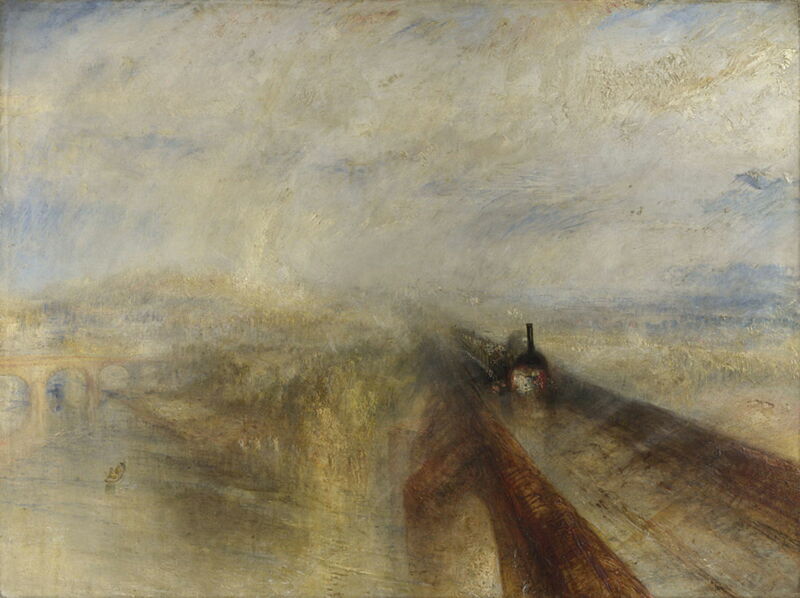 Many of Turner’s later paintings show effects of reduced visibility, but they peaked in his famous painting of a Great Western Railway train crossing the River Thames at Maidenhead: Rain, Steam, and Speed, which was exhibited at the Royal Academy in 1844. The whole image has now become more fogbound and vague – an important precursor to the approach of the Impressionists after Turner’s death. Caspar David Friedrich (1774–1840), Morning Mist in the Mountains (1808), oil on canvas, 71 x 104 cm, Thüringer Landesmuseum Heidecksburg, Rudolstadt, Germany. Wikimedia Commons. 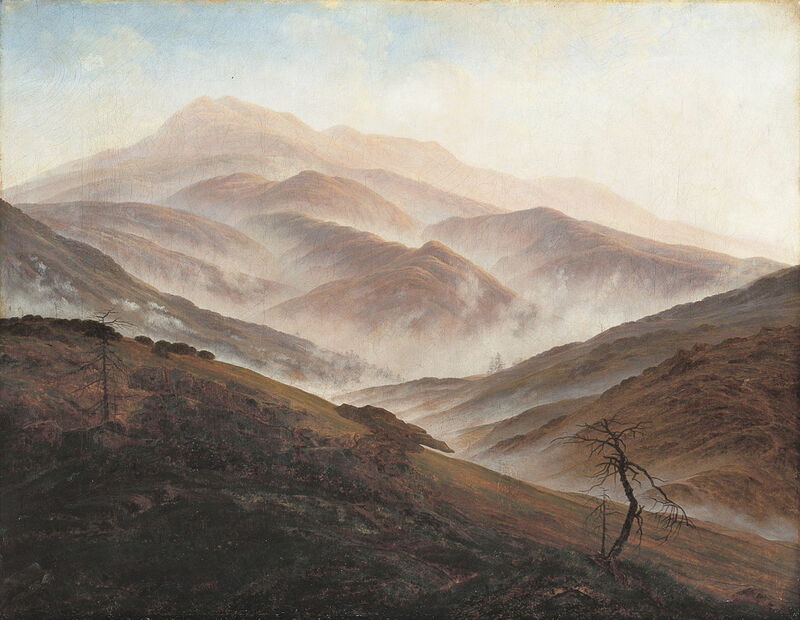 One of Caspar David Friedrich’s earliest paintings in which fog was a feature is his Morning Mist in the Mountains from 1808. This shows the Honigstein massif near Rathen, on the River Elbe, and has a distinctly East Asian look about it. 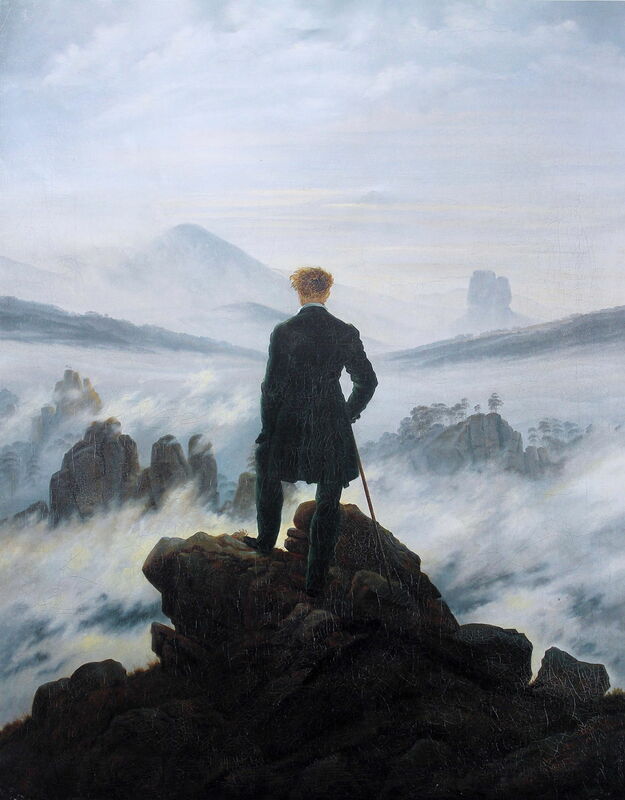 Caspar David Friedrich (1774–1840), Wanderer above the Sea of Mists (1818), oil on canvas, 94.8 × 74.8 cm, Kunsthalle Hamburg. Wikimedia Commons. 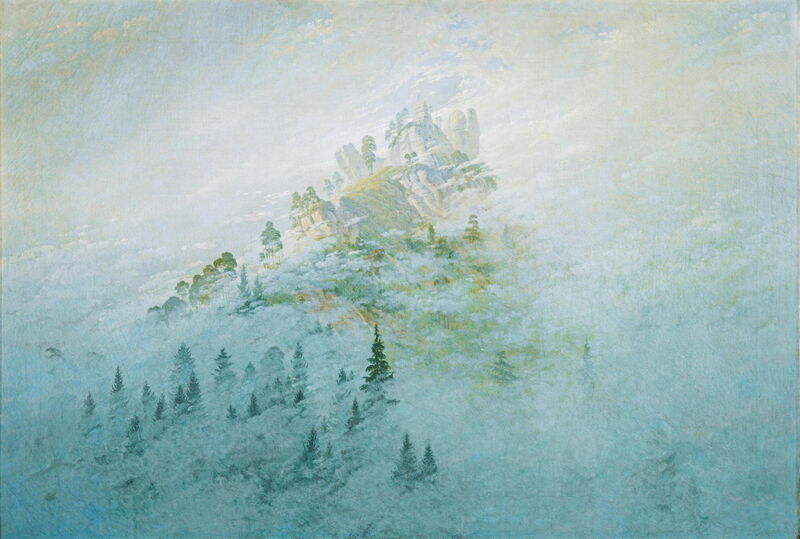 Riesengebirgs Landscape with Rising Fog from 1819-20 shows Friedrich’s further development of the effects of fog in the mountains. The occasional landscape specialist continued to paint a few views modulated by fog. 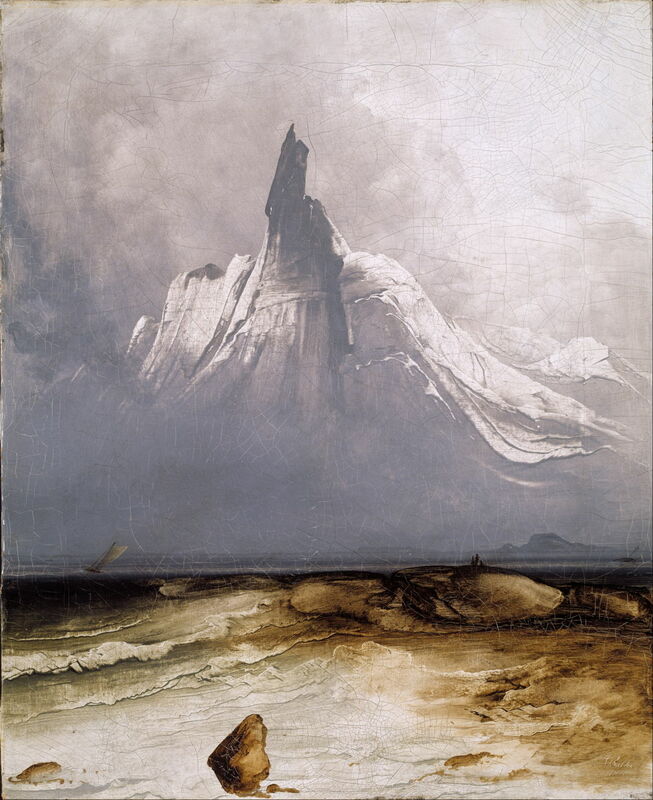 Peder Balke’s Stetind in Fog from 1864 shows Balke’s favourite mountain looking fearfully from a blanket of fog. Fog is exactly the sort of transient effect of light and atmosphere which the Impressionists sought out. 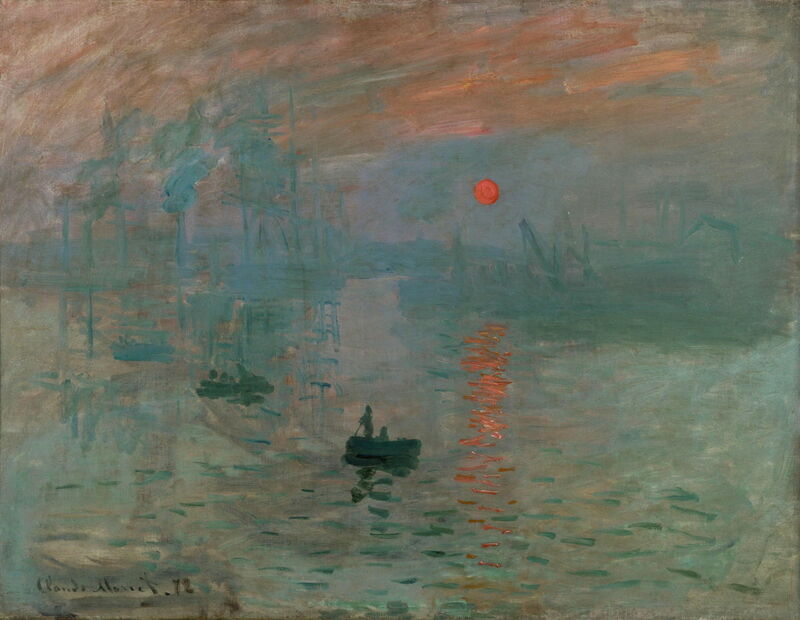 In 1872, Claude Monet painted the view which gave rise to the style’s name, Impression, Sunrise. This appears to be a brisk oil sketch of fog and the rising sun in Monet’s home port of Le Havre, on the Channel coast. It is one of a series which depicted the port at different times and in varying lights. Monet exhibited this in the First Impressionist Exhibition in 1874, where its name became that of the whole movement and its distinctive style. The other Impressionists were quick to join Monet in the fog. 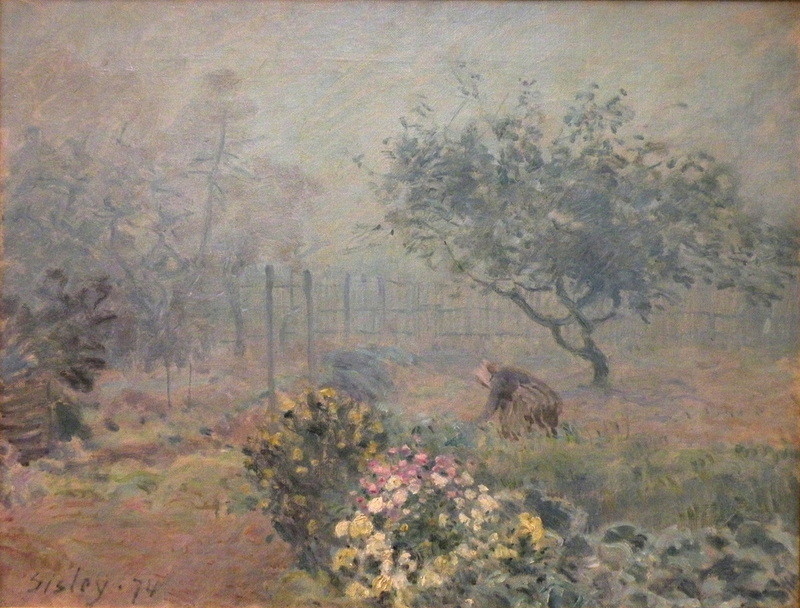 Alfred Sisley’s Fog, Voisins from 1874 shows a fog-cloaked flowerbed in the foreground, the small patch of colour in this garden. The woman working away is not tending her nasturtiums, but toiling away at what will, in a few months time, be carefully prepared and cooked in her kitchen. 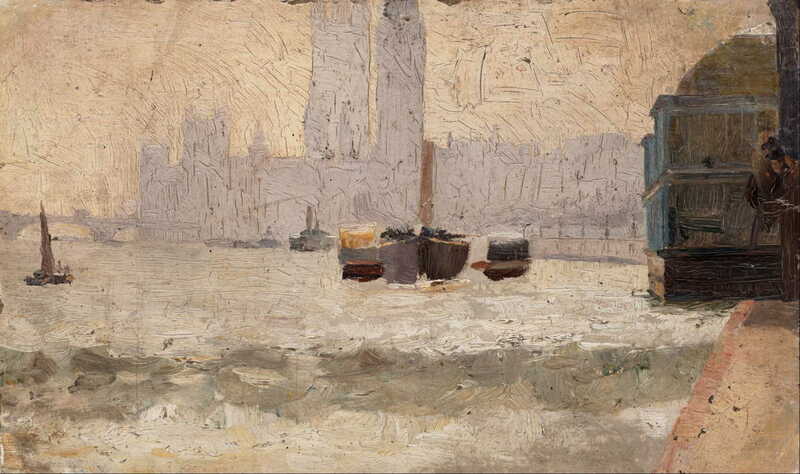 Tom Roberts (1856-1931), Fog, Thames Embankment (1884), oil on paperboard, 13.1 x 21.7 cm, Art Gallery of New South Wales, Sydney. Wikimedia Commons. When the Australian Impressionist Tom Roberts was studying at the Royal Academy Schools in London between 1881-5, he took advantage of the frequent fogs which affected the city to paint Fog, Thames Embankment (1884). This was painted from a similar location to that used by Monet when he was sheltering from the Franco-Prussian War in 1871, on the Embankment to the north of Westminster Bridge. Winslow Homer (1836–1910), The Fog Warning (Halibut Fishing) (1885), oil on canvas, 76.83 × 123.19 cm, Museum of Fine Arts, Boston, MA. Wikimedia Commons. Winslow Homer had painted in London prior to staying in the Engish fishing village of Cullercoats. 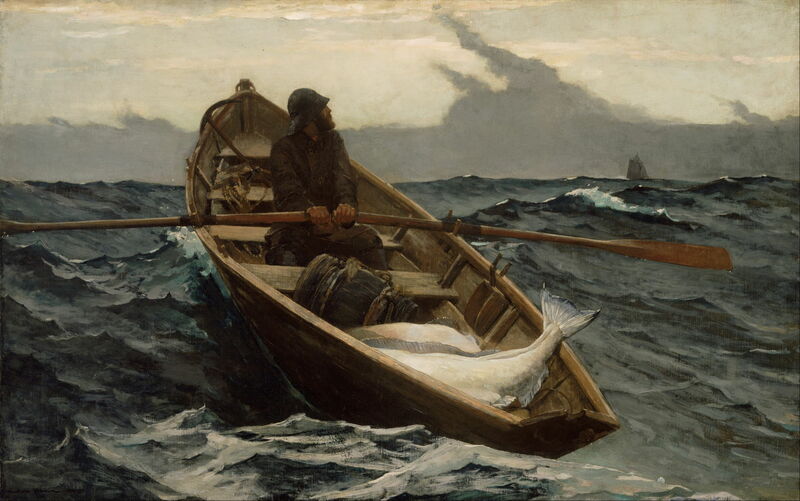 After he had returned to the US East Coast, he painted in even harsher conditions fishing with the herring fleet off the Grand Banks of Newfoundland. The Fog Warning (Halibut Fishing) (1885) shows the ominous sight of a bank of thick fog closing fast on the small boats far out into the North Atlantic Ocean. Emil Jakob Schindler (1842–1892), Sawmill in the Morning Mist (1886), oil on canvas, 84 × 100 cm, Österreichische Galerie Belvedere, Vienna, Austria. Wikimedia Commons. 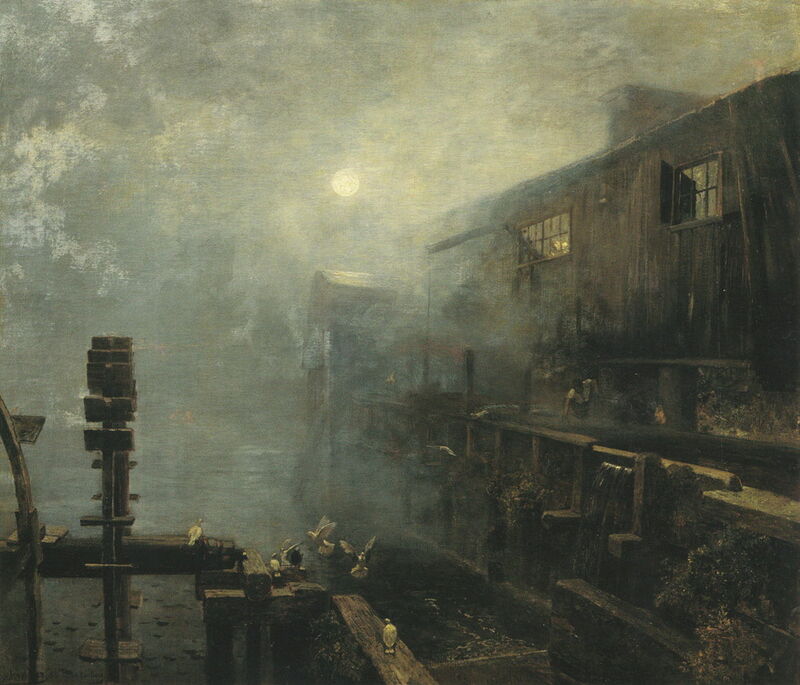 Realist painters of the day such as Emil Jakob Schindler also used fog to great effect, here in his urban setting of a Sawmill in the Morning Mist from 1886. Posted in General, Life, Painting and tagged Balke, Friedrich, Homer, landscape, Monet, painting, Roberts, Schindler, Sisley, Turner, Ying. Bookmark the permalink. It has been marvelously foggy in Italy and this inspires me to go out and paint first thing tomorrow! I hope that was successful? May I add Claude Lorraine to your list of artists who used atmospheric devices to enhance the water’s edge [see “Port de Mer” (1639) and “The Embarkation of Queen of Sheba” (1648)]? Also, last year I made a pilgrimage to Le Havre to witness first-hand the atmospheric effect of the sun from Monet’s perspective. Unfortunately, as is true of most Normandie mornings, it was overcast! Claude certainly painted many works using atmospheric effects to the full – they are magnificent. What distinguishes these later works showing fog is that the atmospheric effect actually takes over a significant area in the painting. Each of these has substantial passages which are white/grey/etc. showing the fog itself, rather than an effect which is modulating the image as shown. It was rather later before anyone was really prepared to sacrifice part of the landscape in order to paint fog itself. Yes, I see that now. Thank you for that clarification.